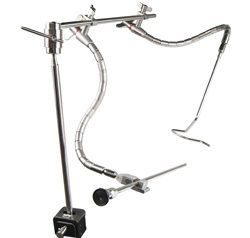 The Twin FlexArm System eliminates the need for an assistant and provides static endoscope and retractor holding for optimized surgical efficienc. System components are easy to set-up in virtually unlimited positions to accommodate any surgical procedure and an array of instrumentation. The FlexArm Plus offers the required holding strength yet permits intra-operative adjustments of the scope and retractor without having to loosen the arm.